Ethnographic resources are landscapes, objects, plants and animals, or sites and structures that are important to a people's sense of purpose or way of life. In other words ethnographic resources are the kinds of resources managed by many other branches of the National Park Service, but understood from the viewpoint of peoples or groups for which they have a special importance different from that enjoyed by the public. Groups may use a park's landscapes to teach beliefs, traditions, and history to new generations through legends or other stories. Urban landscapes, for example, often feature the built environment, which is in fact only a small part of its history and present day importance to park neighbors. Similarly, plantation landscapes evoke different memories among different peoples, black and white. American Indian spirit trails, vision quest sites—in fact sacred spaces in general—may be too elusive for outsiders even to see, or too private for believers to talk about. Yet they may be crucial to a culture's identity and a people's sense of purpose. Objects related to tribes and other groups reside in many park collections. Ethnographers facilitate repatriation of these objects to American Indians, Alaska Natives, and Native Hawaiians—or help interpret them in park exhibits, brochures, and other media. Park neighbors, such as the tribes around Olympic National Park, often have knowledge about plants and animals gathered over centuries. This information offers insight into park ecology and traditional ways of life and serves as an aid to protecting both. 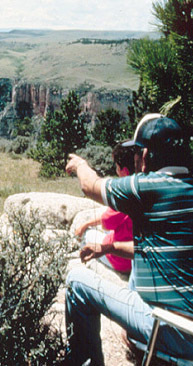 Ethnographers often help reconcile these traditional perspectives and those of the Park Service through the application of research approaches such as ethnobotany. Structures may likewise be integral to a shared way of life or purpose. Japanese Americans still have a strong sense of history and association with WWII internment camps. The birthplace of Martin Luther King, Jr., or African American community churches have close ties with African American neighborhoods while some American Indian tribes believe their ancestors still inhabit the cliff dwellings of the Southwest. Ethnographers heighten awareness of these meanings and tie them both to the sense of history and to the modern-day life of park neighbors and others associated with these resources.